Launching in a torrential rain and lightning storm, a Long March rocket lifted off Tuesday from southwest China and successfully released a navigation satellite in orbit, state-run media reported. The Long March 3A rocket launched at 2144 GMT (5:44 p.m. EDT) from the Xichang space center in southwest China's Sichuan province, according to the Xinhua news agency. The blastoff was at 5:44 a.m. local time and occurred amid heavy rain and lightning, Xinhua reported. The 17-story rocket was aiming for an elliptical orbit stretching from about 100 miles altitude to about 22,000 miles above Earth, where the launcher's third stage was supposed to deploy a Beidou navigation and positioning spacecraft. 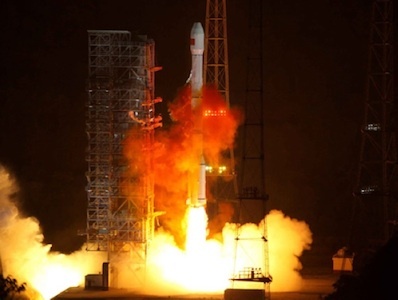 The launch was a success, according to the China Academy of Launch Vehicle Technology. The satellite will circularize its orbit at an altitude of about 22,000 miles and an inclination of 55 degrees, putting the craft in range of users in polar regions. It was the ninth operational Beidou satellite launched since 2007 and the second Chinese navigation payload shot into orbit this year. 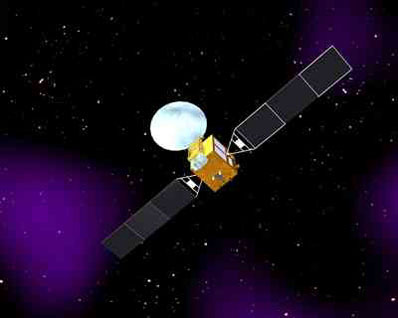 More satellites will be launched through 2012 to expand the Beidou network's coverage throughout the Asia-Pacific region. The Beidou satellite network will eventually consist of 35 spacecraft in orbit providing global navigation and positioning coverage by 2020. The satellite constellation, also known as Compass, is designed to provide precise navigation, timing and messaging services. It is China's counterpart to the U.S. Air Force's Global Positioning System, Russia's Glonass satellite fleet and Europe's Galileo program. Tuesday's blastoff was the fifth Chinese space launch this year after missions that delivered other navigation, communications and military research payloads to orbit. China is scheduled to launch its first human-tended orbital laboratory by the end of September, followed soon after by a robotic Shenzhou capsule that will attempt an automated docking, the first for China's human space program. Chinese astronauts will lift off next year to visit the mini-space station. Other upcoming space missions for China include the launch of a piggyback probe on Russia's Phobos-Grunt mission to Mars. The Chinese launch manifest also calls for flights of more navigation, communications and research payloads.